The original recipe uses raspberries. My husband wasn’t sure if everyone at the barbecue liked raspberries so I changed it slightly in that I used strawberries rather than raspberries. If you do decide to use strawberries you will need to chop them into small pieces. If you’re trying to be healthy and are on a diet I’ll say now that this probably isn’t the recipe for you! It was very popular last night: this quote possibly sums it up in one sentence, “Some desserts aren’t worth the calories, this definitely is!” The only downside of this cheesecake is that it’s not the most stable structure so it doesn’t travel particularly well (particularly if the roads you’re travelling along are full of speed bumps!) I made this during the day but in an ideal world I would have made it the night before so it could set in the fridge overnight so it was really set. You will need an 8 inch (20cm) springform tin. 1) Begin by making the base for your cheesecake. Place your biscuits into a freezer or sandwich bag, seal and bash with a rolling pin until the biscuits become a fine crumb. Tip into a mixing bowl and then mix in the melted butter. Pour into a lined tin and press the mixture down with the back of a spoon or a spatula. Place in the fridge to chill whilst you make the filling. 2) Place a glass bowl over a saucepan of just simmering water (make sure the water and bowl don’t touch). Place the white chocolate in the bowl and melt gently. Once melted remove from the heat and set a side to cool down. 3) Whilst your white chocolate is cooling, use an electric whisk to whip the chilled double cream in a large mixing bowl, until it forms soft peaks. Then in the same bowl fold in the icing sugar (make sure you sift it into the bowl). 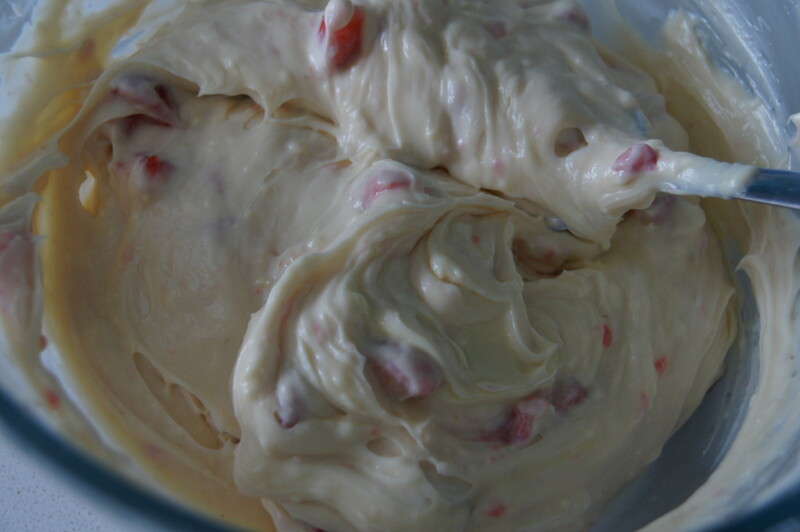 4) Drain away any excess water from the cream cheese. 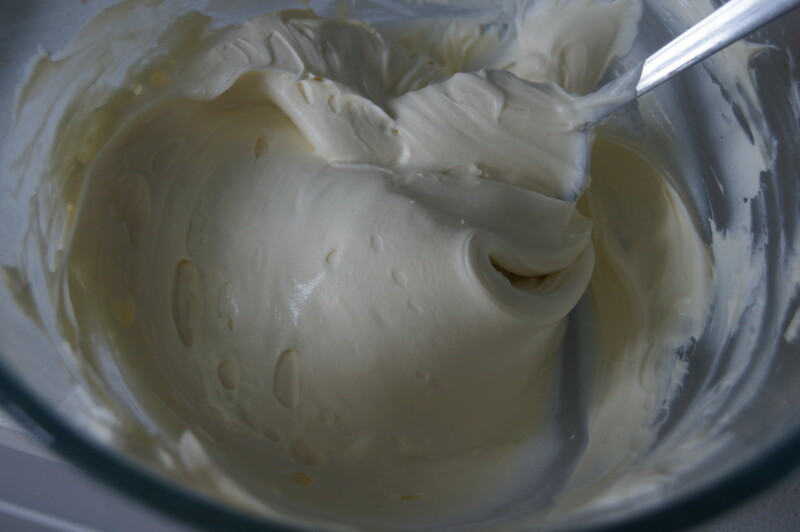 Then add the cream cheese and vanilla extract to the sweet whipped cream and mix together (I used a spoon to do this). 5) Finally add the chilled melted chocolate and raspberries or strawberries to the cream cheese mix and stir together quickly. 6) Remove the biscuit base from the fridge and pour in the cheesecake mix. Set the cheesecake in the fridge for at least four hours or ideally overnight. 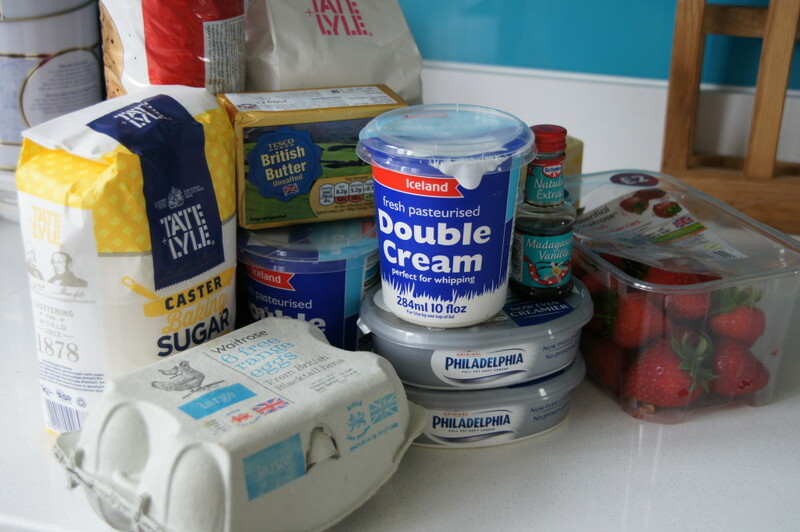 7) Whilst your cheesecake is chilling it’s time to make the meringues for the decoration (you could of course skip this bit and use shop bought meringues here if you’re short on time). Preheat your oven to 110C/100C Fan/1/4 Gas. Separate the eggs whites from the yolk and discard the yolk (or keep them to use them for custard or lemon curd). 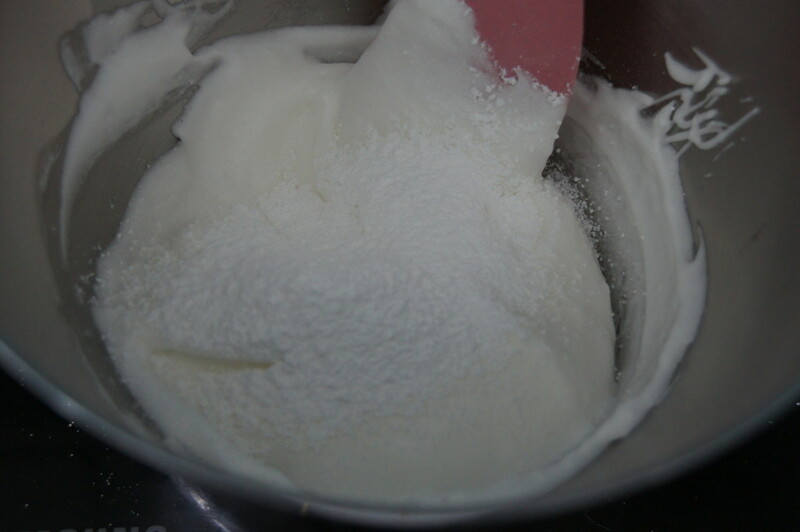 Place the egg whites in a mixing bowl (make sure it is spotlessly clean) and use an electric whisk to beat the eggs on a medium speed, until they are white and fluffy and form stiff peaks when the whisk is lifted. 8) Once your egg whites have reach stiff peaks, turn the speed up on you your electric whisk and start to add the caster sugar, a dessertspoonful at a time. Leave a 3-4 second gap between each spoonful. When the mix is ready it should look thick and glossy. 9) Sift a third of the icing sugar over the mixture, then gently fold it in with a spatula. Continue adding the sifted icing sugar a third at a time and fold into the mixture. 10) Scoop heaped dessertspoons of the mix and make rough rounds on a lined baking tray. Bake for 1 1/2 – 1 3/4 hours in a fan oven, 1 1/4 hours in a conventional or gas oven. 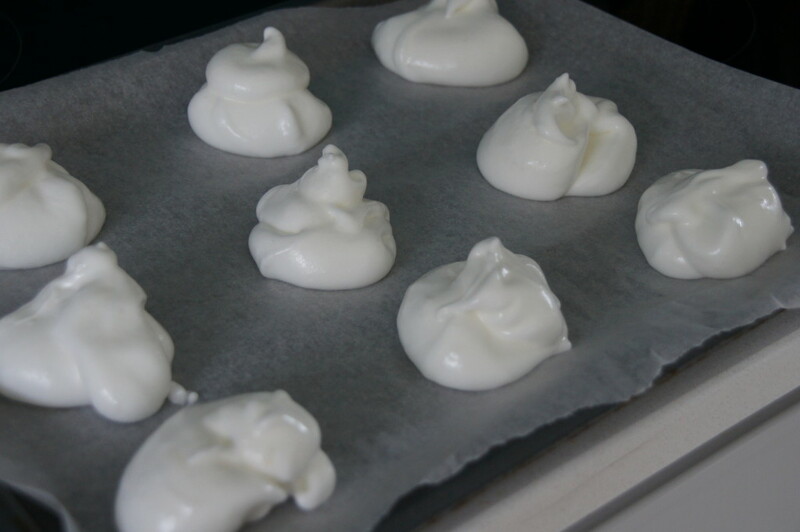 Once the time is up turn the oven off and leave the meringues in to cool with the oven. 11) Once the cheesecake has set and the meringues have cooled it is time to decorate your cheesecake. In a large mixing bowl pour in the chilled double cream and add a tablespoon of caster sugar. 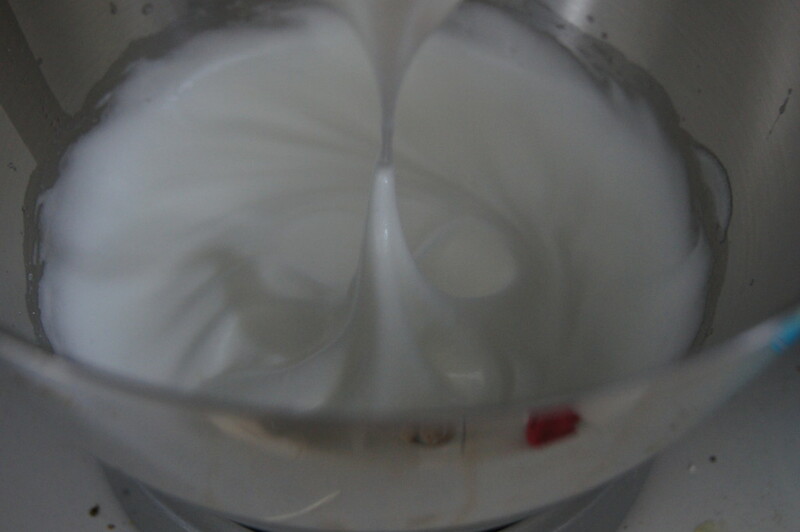 Using an electric whisk, whip the cream until it forms stiff peaks. Transfer half of the whipped cream to a piping bag and pipe around the edge of the top of the cheesecake. 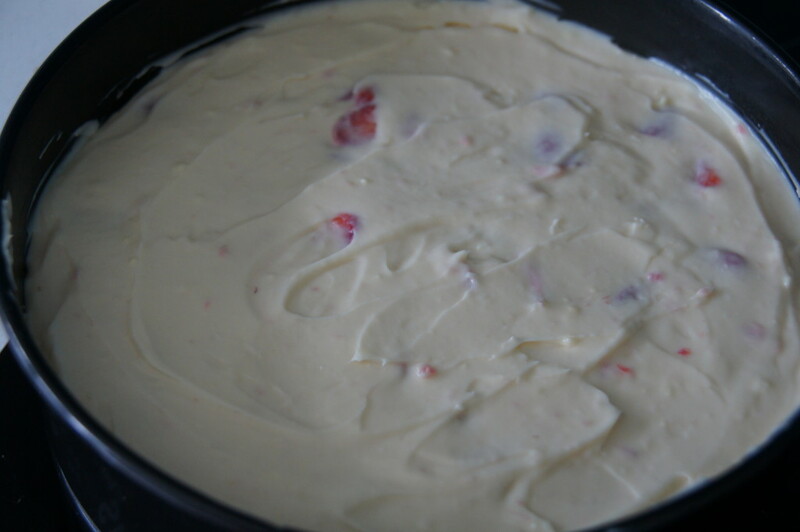 12) Next add the raspberries or strawberries (leave a few to decorate the top) to the cream. Then break up some of the meringues and also add to the whipped cream (leave one or two to crush and decorate the top with). 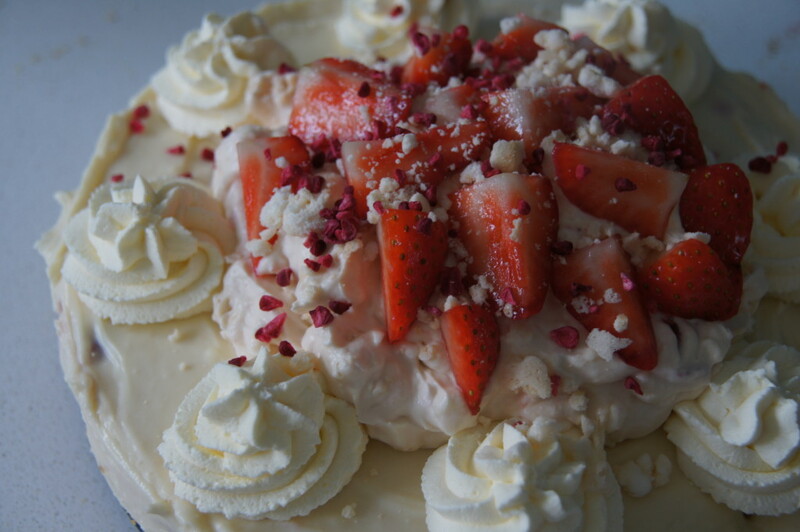 Mix the cream, fruit and meringue altogether. 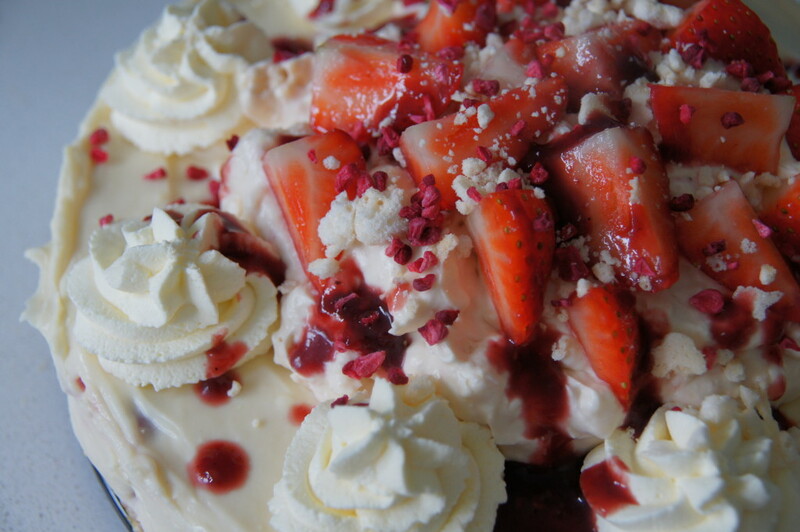 Place the Eton Mess in the middle of the cheesecake, top with more crushed meringue, raspberries or strawberries, a drizzle of coulis and sprinkle of freeze-dried fruit if using.